Ireland will always have a special place in my heart as it was the trip that sparked my love of travel and inspired me to start my blog. When I studied abroad, I arrived in Ireland and was pleasantly overwhelmed by the unfamiliar sights, sounds, and smells that greeted me. The vivid green grass, the colors surrounding Dublin Castle, and, of course, the Irish accents were only the beginning of many journeys to come. When I finally had the chance to return, I knew I had to see some of the sights I missed on my first visit. This 8-day Ireland itinerary walks you through my return trip day-by-day so you can experience the ultimate Ireland itinerary for yourself. Discover the literary history, friendly people, and welcoming pubs in Dublin, Ireland’s largest city and its capital. Dublin’s rich heritage and cheerful atmosphere make for the perfect destination for all travelers. 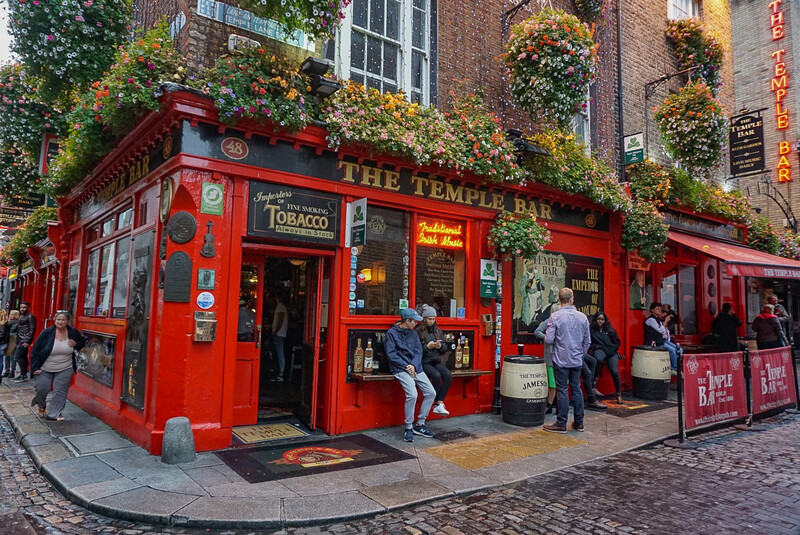 There is no shortage of things to do in Dublin, whether you visit the Dublin Castle, explore the city’s many cathedrals, or take advantage of the lively pub scene. There is always live music going on around the city, making for a perfect way to enjoy that pint of Guinness. For the history buffs, there are plenty of historical buildings, sites, and other attractions for you to discover. Check out the posts below for the full scoop on the best of Dublin! Galway is an easy train ride away from Dublin that takes about two hours and 30 minutes. I booked directly with Irish Rail. Galway was one of my favorite places in all of Ireland. It’s less crowded than Dublin yet still has a buzzing city centre along the seaside. It’s also a great base for doing day trips along Ireland’s western coast. The iconic Cliffs of Moher had been calling my name since the very first time I visited Ireland. The Cliffs of Moher tour we did was the perfect day trip from Galway. We didn’t have a car during this Ireland trip, so this was a great way to venture out to the cliffs without having to rent one. Towering 214 meters (702 feet) above the Atlantic Ocean, the Cliffs of Moher have been defining their home along an 8-kilometer (5-mile) stretch along the Irish coast for over 350 million years. Actually seeing the Cliffs of Moher in person is better than you could ever imagine. The sturdy layers of compacted mud, silt, and sand make up the jarring cliffside that stands strong against the crashing waves. On this tour, you’ll have at least an hour to stroll along the cliff top, take in the breathtaking views, and stop in the visitor’s centre to learn more about the cliffs and their sustainability practices. The entry fee to the cliffs and the visitor’s centre is included with the tour. Yes, I know Northern Ireland is part of the UK. But for the sake of geography, I’ve included it in the Ireland itinerary. To get to Belfast, we had to take the train back through Dublin as there is no direct route there from Galway. You can book the trip all the way from Galway to Belfast (I also booked this with Irish Rail), but you’ll just need to switch trains (and likely stations) in Dublin. Although Belfast is less than half the size of Dublin, two thirds of the people of Northern Ireland live there. After suffering political violence during the Troubles, Belfast is now a peaceful city that is quickly growing and developing. With so many things to do in Belfast and the surrounding areas, now is a great time to bump Northern Ireland up on your travel list, and definitely include it in your Ireland itinerary. The scientific explanation for the 40,000 interlocking basalt columns of Giant’s Causeway is due to a volcanic eruption 60 million years ago. Their hexagonal shape makes them look like they’ve been carved by man because they are such an odd natural phenomena. Each stone you step on will take you back to the legends of the past. And you better believe there are legends! If you’re not renting a car in Northern Ireland, the best way to see Giant’s Causeway is on a guided tour. I even prefer the tour in this case, because we got a lot of background information along the journey that I wouldn’t have known otherwise. I booked the Giant’s Causeway Full Day Tour from Belfast, and the article below details my full review of the tour. The only thing I would do differently? Extend my stay! You’ll notice that I didn’t include any of southern Ireland, which I decided to save for my next trip when I have more time. But if you can spend more time, there is so much more to explore that you can add to your Ireland itinerary. Accommodations: Hotels can be cheaper during the off season, but especially during peak season I would recommend searching for apartments on Booking.com for the best accommodation options. They have tons of affordable choices all throughout Ireland, and you’ll get much more of a local experience! You can also take a look on Airbnb for alternate options. If you use that link, new users will receive $40 off your first stay! Gear: If there’s one must-have item on your Ireland trip, it’s a rain coat. Regardless of the time of year, some amount of rain is likely in the forecast! You’ll also be doing a lot of walking, so be sure bring along a pair of Allbirds, my favorite travel shoes. Of course, packing cubes and a travel adaptor will come in handy too!